Designer Riley McFerrin was raised in a place that celebrates its artificiality: Los Angeles. But because he married a Canadian (and hated L.A.’s smog), he now lives somewhere almost entirely natural: British Columbia’s serene Sunshine Coast. The unspoiled environs inspire his work. At his year-old studio Hinterland, he hand makes light fixtures from foraged beach branches, and crafts side tables that echo the crystalline shapes of the Rockies. 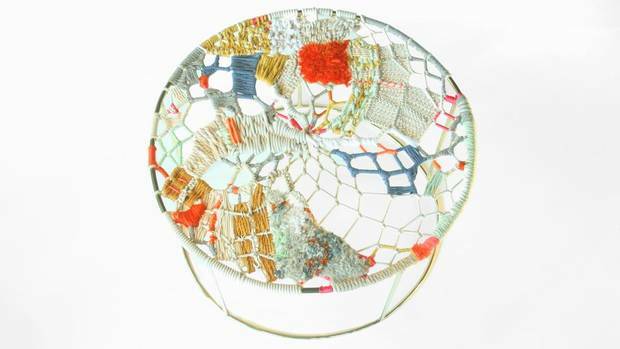 His Tidal Flux Ottoman (co-created with his wife, illustrator Sara Gillingham, as well as fibre artist Coral Harding) takes after the humble, netted crab trap. The rope work – a mix of macramé, crochet and sailors’ knots – looks delicate but is highly durable. The cotton, wool and nylon cords are wrapped around a brass-covered, stainless-steel frame and are tied to withstand wind, rain and the roughest of seas. Tidal Flux Ottoman $3,000. hinterlanddesign.com. This piece originally appeared in the Globe and Mail on Thursday, June 12, 2014. This entry was posted in Uncategorized by mmhague. Bookmark the permalink.